c.1982? | age 14? Not very funny is it? I didn’t even finish off Solo’s arm. No seriously, I’d never go along to it but Johnny loves Star Wars, so hopefully it’ll be a terrific experience for him – and his 5 year old cousin. To be honest, knowing what little kids are like, they might be underwhelmed by it! Even if so, we’ll take lots of photos and he can enjoy it when he’s older. I missed bringing him to meet Ozzy Osbourne last year so this’ll make it up. “They shouldn’t have done it. It just looks… sad.” I really did feel a bit sorry for them. So, do we need to get close to them? Perhaps it’s better to be content with those old films themselves, rather than craving a piece of the people involved in them as well. Fans of various things often say “THEY OWE IT TO US GODDAMMIT! We put them where they are.” I really don’t agree. Obsessive fans obsess because they can’t help themselves, wanting more and more and more. The original object of their love isn’t enough and they get into the whole diminishing-returns syndrome of the expanded universe and the disappointment that goes with it. If an actor appeared in a film in the 1970’s for–probably–a fixed one-off fee aren’t they allowed to ‘move on’? Another thing, someone said to me years ago: “Never meet your idols”. He’d worshipped a well-known, extremely talented Irish folk-pop musician for years and finally met him after a gig. The star was so obnoxious that his fan could never bring himself to listen any of his music again. But perhaps it was a bad night?–perhaps his mum had died the day before?–maybe he’d just received a scary medical report? He’ll always be guessing as to the real reason for the star’s demeanour, but the associated bad feeling will linger. That said, I think Johnny will like it, (UPDATE: he did!) and maybe his mum and dad will too. Let’s just hope that the actors, are allowed to–or manage to maintain their dignity. 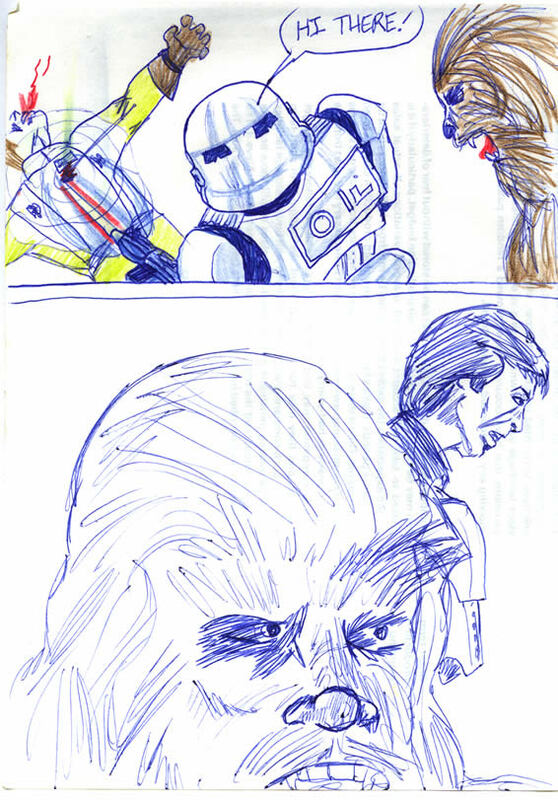 Perhaps I’ll ask Kenny Baker and Dave Prowse to autograph this comic–if they don’t mind of course. At least I can truthfully promise never to sell it on eBay! So, should our Johnny dress as a Clone Trooper or Darth Vader?